We are counted as consistent firm actively involved in providing modern design of Ladies Backpack. Carry your knick knacks and every day essentials in a unique way with this compact, lightweight and stylish backpack. The design and aura of this bag is carefully selected to match with the style preferences of college students. 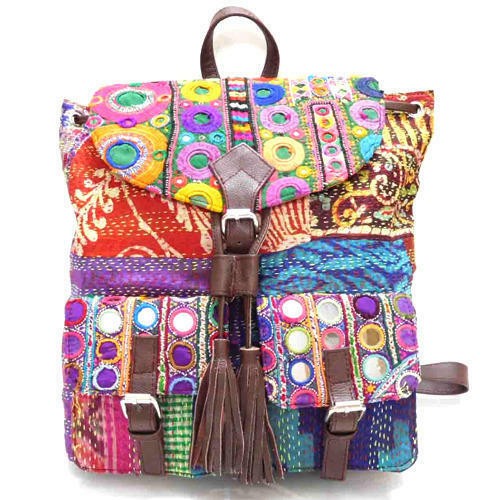 Ideal to be used by young generation the ethnic vibe of this backpack attracts women of all age groups. The year was 2001 when we My International were starting and then onwards are successfully operating the heavy business of manufacturing, wholesaling, trading and exporting a wide assortment of Ladies Necklace, Hair Accessories, Necklace Cord, Ladies Bracelet, Ladies Bangle, Ladies Earring and many more. Offered range is made using only high-quality components. These products are admired by the clients for their attractive attributes like easy usability, light weight, strong, attractive, stylish design, and skin friendly nature. Moreover, these offered products are used by the ladies on various occasions. Banking on our enriched industry experience, we are able to understand the variegated needs of fashion industry and offer the most appropriate range of products. The complete designing process is done in our infrastructure, established over a large area of land. We strictly follow the industry laid norms and, thereby, provided product array offered with perfect finishing and assured quality. In addition to this, owing to our optimum grade products range, we have developed a huge client in the market.